IMPACT Service Breaks was named the 2018 Organization of the Year at the 17th Annual SOAR Awards, held April 5 at the Tate Student Center. Members of IMPACT’s student executive board are (from left) Shivangi Medhekar, logistics coordinator; Yvonne Clifvonne Webb, executive coordinator; and Joshua Clifford, outreach coordinator. 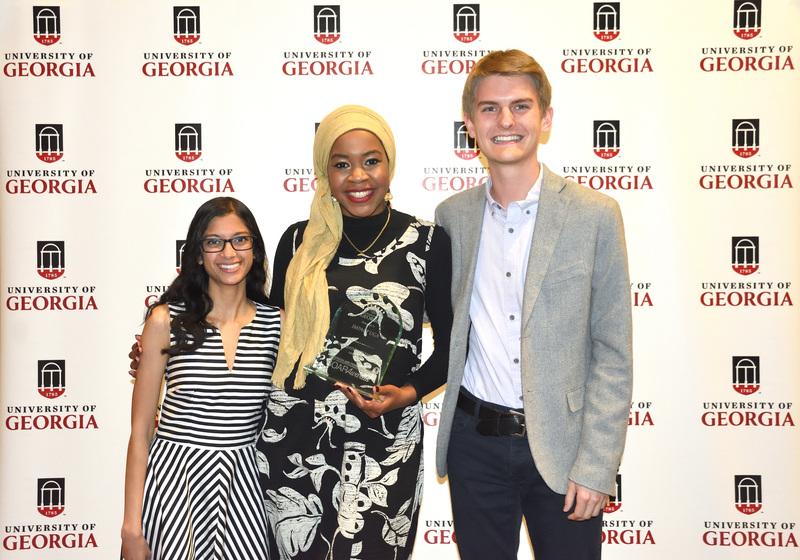 IMPACT Service Breaks was named “Organization of the Year” during the 17th Annual H. Gordon and Francis S. Davis Student Organization Achievement and Recognition Awards, given out April 5 at the Tate Student Center. The SOAR Awards celebrate the accomplishments of student organizations at the University of Georgia. Since its inception in 1994, IMPACT has focused on expanding its influence through 26 service break trips held during fall, spring and summer breaks. 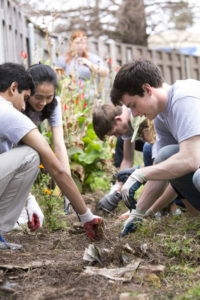 The organization’s goal is to create active citizens by engaging students in affordable, substance-free, experiential service-learning projects that encourage an understanding of pressing social issues. IMPACT Spring Break students planting and painting in New Orleans in 2016. Currently, there are 16 trip foci including LGBTQ awareness and advocacy, food justice and Native American cultural awareness and advocacy. Organizers build a time of reflection into each trip’s schedule to equip the participants with the motivation and knowledge to engage in service and the social issues of their own communities. IMPACT is administered through the Center for Leadership and Service within UGA Student Affairs. • Most Innovative Program: Indian Cultural Exchange for the “Mental Health Mondays” awareness campaign. • Organizational Improvement: Journal of Language & Literacy Education for extending its professional presence and enhancing its administrative and marketing efforts. • Organizational Collaboration: HOSA-Future Health Professionals, One Health Club, Residence Hall Association for relief efforts in response to Hurricanes Harvey, Irma and Maria. • Outstanding Campus Event (Small): Language & Literacy Education Graduate Organization for a three-day conference featuring researcher and professor David Bloome. • Outstanding Campus Event (Large): Hispanic Student Association for Noche Latina – Identidad, an evening of cultural expression focusing on how the Latinx culture has impacted America. • Outstanding New Organization: Athens Prison Tutorial for its work helping prison inmates achieve their education goals. • Commitment to Social Justice: Journal of Language & Literacy Education for its advocacy for diverse voices in both its publication and its annual conference. • Outstanding Cross-Cultural Program: African Student Union for Africa Week, a series of programs dedicated to sharing the cultures of African nations. • Outstanding Service to the Community (Small): ServeUGA for providing extensive volunteer opportunities for students. • Outstanding Service to the Community (Large): Camp Kesem for its support of children whose parents are fighting cancer. • Bulldog Vision: Sarah Burns, Residence Hall Association for her work to improve organization and efficiency in officer transition. • Pillar of the Community: Rishi Masalia, Athens Science Observer, for his efforts to increase scientific literacy on and off campus. • Advisor of the Year: Vanessa Smith for her work with the Georgia Daze Minority Recruitment Program. • Candice Sherman Emerging Leader: Jazmin Carswell for her leadership improving the marketing efforts of the Student Alumni Association. This year, 106 nominations were submitted for 56 unique organizations. A panel of 44 faculty and staff members judged the nominations. There are currently 809 registered student organizations on campus.